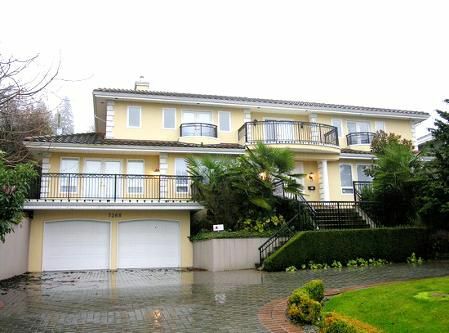 Burnaby's best Westridge location - Panoramic views of North Shore mountains, Burrard Inlet, Capital Hill and Vancouver. European crafted mansion with the highest quality of finishing including marble and granite, wrought iron, stainless steel, best berber carpets, crown mouldings - nothing has been left out! This offering includes $300,000 in brand new fine home furnishings from Jordan's, as seen in the pictures. The elegant entry foyer gives a memorable introduction to the class of this executive residence. A crystal chandelier in this atrium indicates the opulence to be found throughout the house. A chef's dream kitchen exudes quality with the abundant cabinets and granite counter space, Bosch and Sub-Zero appliances. Kitchen adjoins spacious nook and family room. Formal Living and Dining rooms are just off the foyer. Also on the main floor is a bedroom with full 4 pc. ensuite, office and laundry. Upstairs the Master suite is exquisite, with double walk in closets and a bathroom which needs to be seen!, Incredible executive view home!